As your children grow up, their mouths are in an almost continuous process of change. Here, you can learn a bit about what to expect during your child's oral development between the ages of 4 and 6. 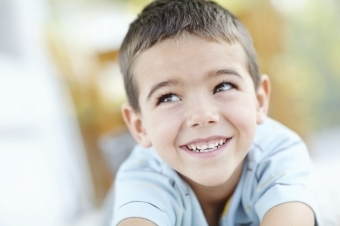 By the time they're 3, most children have finished developing all of their primary teeth. By 4, their jaws and facial structure begin to develop and grow, creating spaces between the primary teeth. This happens so that room is available for the larger, permanent teeth to eventually erupt. Then, starting at around the age of 6 until approximately 12, your child’s permanent teeth will erupt. Remember, primary teeth are equally important in the development process as permanent teeth. That they eventually fall out does not change the fact that they need to be carefully cared for and cleaned. Primary teeth allow children to speak and chew properly, make space in the gums for future permanent teeth to grow in, and guide them into the correct positions, too. When children are between 4 and 6 years old, it's a good ideas to start teaching them to brush and floss their own teeth. Most children’s manual dexterity has developed to the extent that they can hold a toothbrush and dental floss correctly at this age, and they are mentally capable of understanding the steps involved in brushing and flossing, and can also understand why it’s important to keep their teeth clean. This is a great age at which to help children establish good oral hygiene habits that will last for their whole lives. They’ll still need help, guidance and supervision, though, to ensure that they’re thorough enough, and clean each and every tooth. Read more about brushing and flossing for children here, or get in touch with the team at Smile Town North Delta, and book a consultation appointment. During your child's checkup and cleaning, we'll review the details of good brushing and flossing techniques.